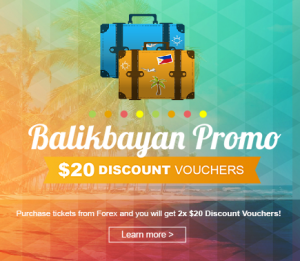 Purchase your tickets through us and as a token of our appreciation we will include 2 x $20 discount vouchers for you to use for Forex Cargo boxes. 1 Discount voucher may be used per Forex box and this discount will be valid up to 3 months after your International Ticket purchase. There is no better way to send your pasalubongs or bulky items than in a Forex box. Why bring them in your maleta where you may be charged for overweight baggage? Plan ahead, send it in advance and have peace of mind when you travel. All you have to do is hand in the voucher (will be sent through mail) when we pick-up your box and we will be more than happy to send your goodies, the Forex way. 1 Discount voucher may be used per Forex box. 2 discount vouchers cannot be used for the same Forex box. Discount vouchers are valid for up to and not exceeding 3 months from the time international Tickets have been purchased from Forex Travel. Discount voucher must be presented and handed over to Forex representative upon pick up of Forex box. Vouchers are not transferrable (therefore must be used by the person who’s name appears on the discount voucher. Voucher cannot be exchanged or redeemed as cash. If you would like Forex to deliver empty boxes to you, call us on 1300 136 739 or email us at reservations@forextravel.com.au. So what are you waiting for? Call us now and let’s deliver love today!